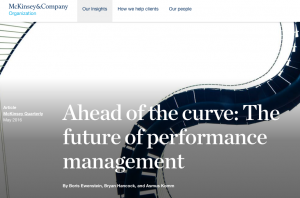 McK on "The future of performance management"
Many thanks to our colleague David Puentes from the Business Performance consulting LinkedIn group for sharing this McK article : nice 2017 start ! In « Ahead of the curve : The future of performance management« , everything is about « meaning—seeing purpose and value in work—was the single most important factor » in motivating people, not money ! As I experienced in previous Value Management projects, as early as in 2003 while working on « 35 heures » working time reduction projects in France, earning more money does not push many people to work better or more (only 12% ‘promoters’ in Process Com profiles). But saving time for themselves was a very good productivity lever when it applied : the ‘you can leave when you have finished‘ effect 😉 And receiving money because you worked well just puts more stress by ‘you’ll have to earn it next year‘. « what is enough to motivate people at work ? » : money for some of the best ‘promoters’, purpose for all, in every occasion, by simple constructive feedback from stakeholders ! As McKinsey points out in this article with many examples, companies can better satisfy employees AND save a lot in complex compensation schemes, KPIs and bonuses by focusing on continuous stakeholders mutual evaluation and special bonuses for special people. This is precisely the idea behind the benchmarking survey just launched on « value(s) creation by Purchasing » presented in an earlier article. Article précédent : Purchasing : « Savings calculation » or « value(s) creation » ?